“[She] dazzled observers last year with her off-the-shoulder cape in brilliant red. No sparkle or shine, just a rapturously dramatic effect that made her the talk of last year’s show. This year, even as part of a nominated cast (for the Marvel hit Black Panther), she came in a blue number with beaded fringes that didn’t do much to offend or raise eyes,” says Jose. “[Her] gown featured glass beads set into a chain mail pattern and draped over a corseted bustier in metallic pink. It gave her presence befitting her rigorous dramatic roles this year in Seven Seconds and If Beale Street Could Talk.,” says Jose. “[She] put her hat in the bling ring with a dazzling silver chain mail jacket over a somber black gown from Claire Waight Keller of Givenchy Haute Couture, that combined elements as disparate as a criss-cross bra to to sheer organza paneling that extended the gown’s skirt to a sumptuous ripple of floor-grazing soft pleats,” says Jose. “[Her] use of chain mail was restricted to the crystal-beaded panel that bound the top and bottoms halves of an empire-waisted Gucci dress in a rose-colored crush velvet,” says Jose. There didn’t seem to be a ton of risks at the Golden Globes this year. This year’s attendees diligently stayed in their sartorial lanes, almost on cruise control with a safe round of tastefully draped and beaded ensembles in traditional shapes and softly hued monochromatic jewel tones. Good old-fashioned Hollywood beading and sequins added glamour and weight to looks that otherwise would’ve seemed old hat. Some attendees, such as Claire Foy and Rachel Brosnahan tried in creamy canary yellow. Lupita Nyong’o dazzled observers last year with her off-the-shoulder cape in brilliant red. No sparkle or shine; just a rapturously dramatic effect that made her the talk of last year’s show. 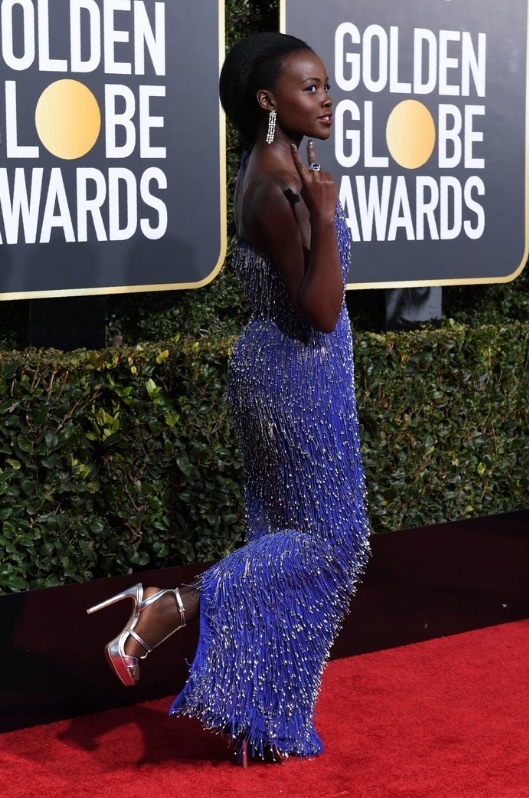 This year, even as part of a nominated cast (for the Marvel hit Black Panther), she came in a blue number with beaded fringes that didn’t do much to offend or raise eyes. For actresses that wanted to lend some gravitas to the rather traditional take on glitter that beads and sequins offered, a little heavy metal did the trick. Regina King’s Alberta Ferretti gown featured glass beads set into a chain mail pattern and draped over a corseted bustier in metallic pink. It gave her presence, befitting her rigorous dramatic roles this year in Seven Seconds and If Beale Street Could Talk. Rosamund Pike put her hat in the bling ring with a dazzling silver chain mail jacket over a somber black gown from Claire Waight Keller of Givenchy Haute Couture. It combined elements as disparate as a criss-cross bra to sheer organza paneling that extended the gown’s skirt to a sumptuous ripple of floor-grazing soft pleats. 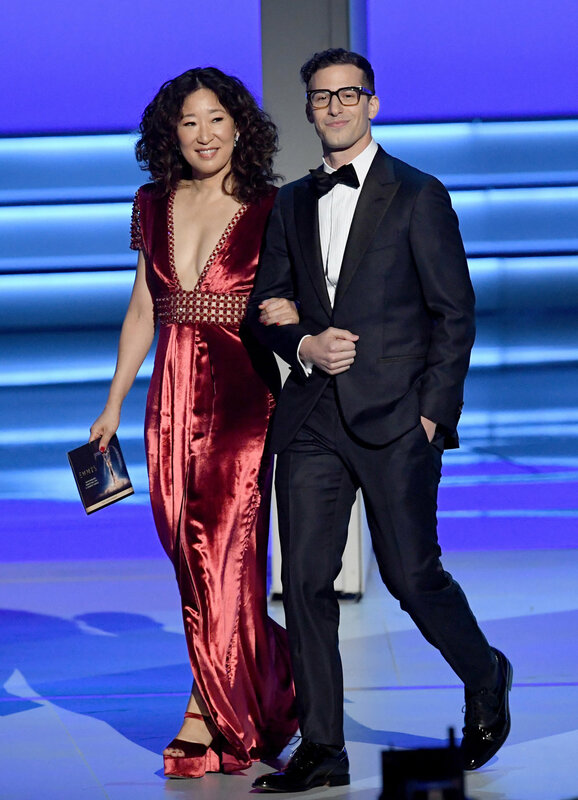 Show host Sandra Oh’s use of chain mail was restricted to the crystal-beaded panel that bound the top and bottoms halves of an empire-waisted Gucci dress in a rose-colored crush velvet. Saoirse Ronan’s considered shimmer also came by way of Gucci: A plunging neckline and delicate arches of silver beads that sloped across strips of chain mail before they softly grazed the floor. Its gentle sparkle was set off by flesh-toned panels that suggested all kinds of adventures by the end of the night. “[Her] considered shimmer…came by way of Gucci: A plunging neckline and delicate arches of silver beads that sloped across strips of chain mail before they softly grazed the floor. Its gentle sparkle was set off by flesh-toned panels that suggested all kinds of adventures by the end of the night,” says Jose. “[He] turned heads…by premiering Virgil Abloh’s first red carpet look for Louis Vuitton menswear: A body harness, fully beaded over basic black. It was all the shine he needed,” says Jose. “She worked the collective world’s nerves with a six-foot train on her double duchess satin Valentino gown,” says Jose. There might be precious few left who can even remember when Kristin Cavallari’s reality show Laguna Beach ruled the cable box. But, she found a way to make everyone remember them. At least for tonight with her more revealing, burlesque-inspired take on the beading trend. The truly gifted can pull off the same effect of glimmer and sequins with nothing more than thread. That accolade goes to Sarah Burton of Alexander McQueen and her muse, Emily Blunt. An intricate lacing of meticulously embroidered appliques built structure into a weighted skirt that seemed to dissipate at the bodice and the knees to reveal ample leg and flesh tone panels up top to create one of the most striking dresses of the night. The menswear looks this year were not plain, per se: Idris Elba tried the tie-free thing with a spread collar shirt peeking out under a printed tux in iridescent loden green — with matching shoes. John Krasinski went with a reliable navy blue, Christian Bale paired his traditional black tux with more black. Handsomely tailored, but breaking no rules in 2018. Maybe that’s why Timothée Chalamet, who has not disappointed with his red carpet debuts, turned heads again by premiering Virgil Abloh’s first red carpet look for Louis Vuitton menswear: A body harness, fully beaded over basic black. It was all the shine he needed. In a night of measured, tasteful evening wear trends, it takes an artful gimmick to stand out, especially when your 2019 heralded a major motion picture acting debut and your first Las Vegas residency, but Lady Gaga is a pro. She worked the collective world’s nerves with a six-foot train on her double duchess satin Valentino gown.